Scott Mitchell holds Starry, one of the Nigerian Goats at Damnifiknow Farms on Indian Island. Scott and his wife, Stephanie Mitchell, run the farm where they have chickens, goats and several pets. They sell pullets, eggs, chicken meat and soap. Stephanie Mitchell checks on the Cornish Cross meat chickens as she fed the animals Wednesday morning at Damnifiknow Farms on Indian Island. Stephanie and her husband Scott Mitchell run the farm where they have chickens, goats and several pets. They sell pullets, eggs, chicken meat and soap. Scott Mitchell heads back to the house after the morning chores at Damnifiknow Farms on Indian Island. Scott and his wife Stephanie Mitchell run the farm where they have chickens, goats and several pets. They sell pullets, eggs, chicken meat and soap. 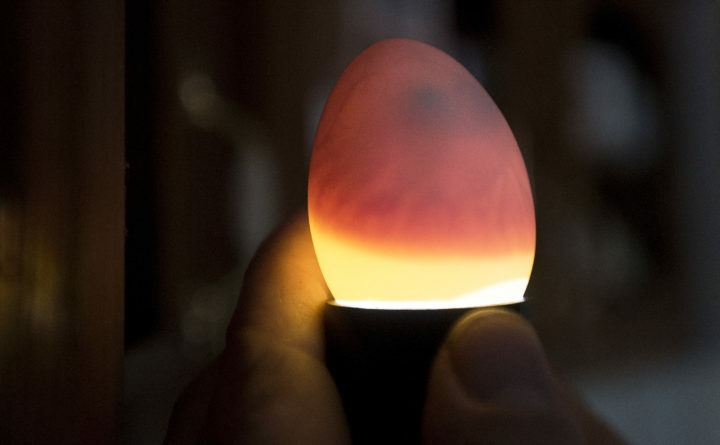 Scott Mitchell candles eggs to check if they are viable at Damnifiknow Farms on Indian Island. Scott and his wife Stephanie Mitchell run the farm where they have chickens, goats and several pets. They sell pullets, eggs, chicken meat and soap. 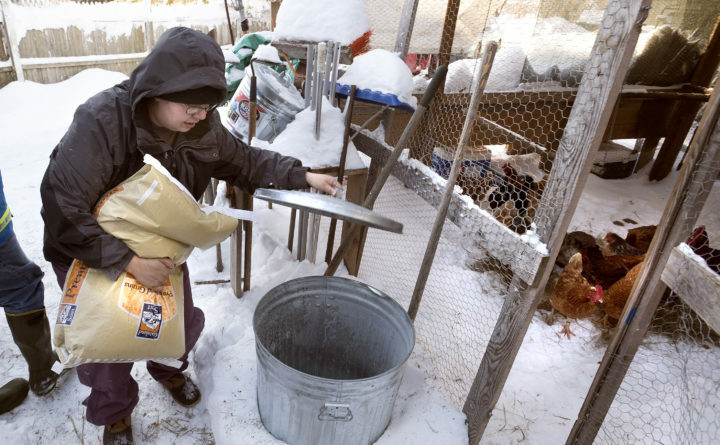 Stephanie Mitchell lugs a bag of chicken feed as she was getting ready to feed the animals Wednesday morning at Damnifiknow Farms on Indian Island. Stephanie and her husband, Scott Mitchell, run the farm where they have chickens, goats and several pets. They sell pullets, eggs, chicken meat and soap. Goat’s milk soap made by Stephanie Mitchell at Damnifiknow Farms on Indian Island. 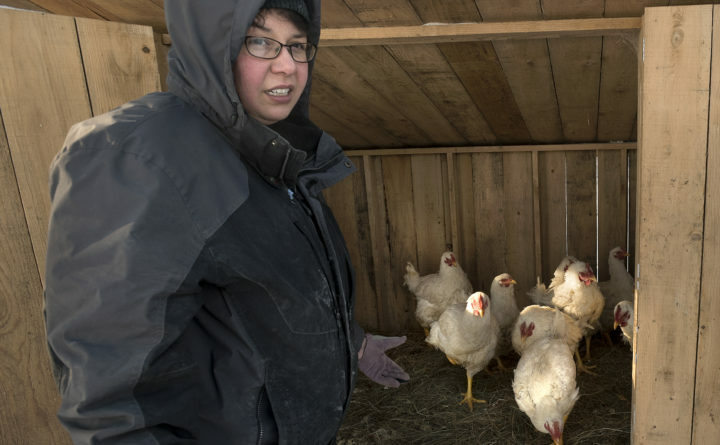 Stephanie and her husband Scott Mitchell run the farm where they have chickens, goats and several pets. They sell pullets, eggs, chicken meat and soap. INDIAN ISLAND, Maine — On a brilliant, frosty morning this week, as the temperature hovered around 5 degrees Fahrenheit, Scott and Stephanie Mitchell pulled on heavy boots and insulated overalls before heading outside to take care of the chickens and goats that share their 1-acre Damnifiknow Farms. 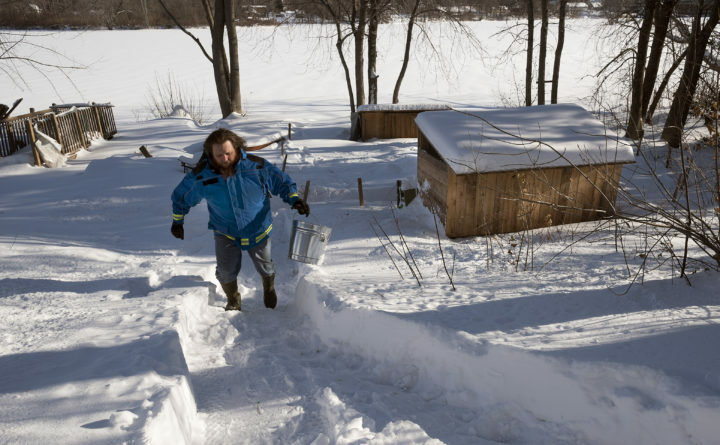 Morning chores don’t always go quickly with 80 or so animals to tend to, and the Mitchells make sure to spend a little time at each of the wooden pens that dot the backyard that stretches out to the Penobscot River, covered with a thick layer of ice and snow. 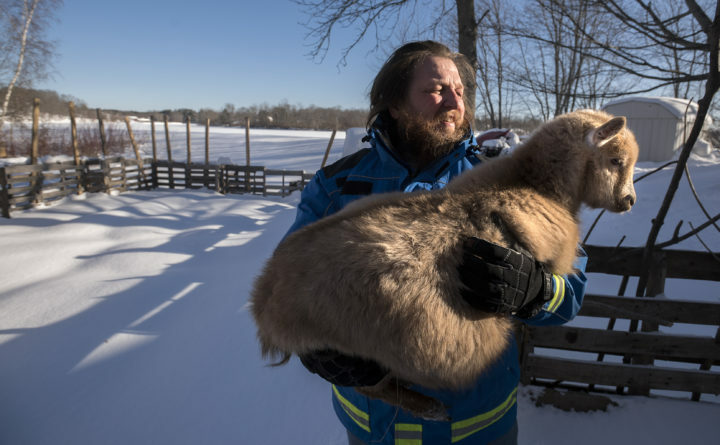 Close to the edge of the frozen river, Scott spotted something in the snow that looked ominously like the tracks of a would-be chicken predator. He loped through the snow to check on the tracks, coming back to report that they actually appeared to be made by snow falling off a tree. You can never be too careful on a farm where an American bald eagle once swooped in from the Penobscot to seize a chicken from their yard, killing that one directly and five other birds indirectly when their hearts, the Mitchells think, burst from fright. Or where one time a hawk perched hungrily on their front porch, eyeing their birds until Scott Mitchell came over for a chat. Scott, a burly 46-year-old veteran of the U.S. Marines, is covered with tattoos and might be mistaken for a tough guy. But he talked to that bird with patient understanding, telling the hawk that he knew it had to eat, too. He simply requested that it leave the family’s laying hens alone, and pointed out the chickens the hawk could take if it needed to. In the end, the hawk flew away without bothering any of the chickens that help feed the Mitchell’s family and their community. Scott wasn’t too surprised. Maybe things just work out that way sometimes for a couple of Penobscot Indian homesteaders trying to farm on Indian Island with care and attention to the animals they are raising. Some of that care is connected to native American traditions and ways. And the Mitchells certainly are not the only Penobscots, Passamaquoddies or Micmacs in the state now combining farming and homesteading with native American values. Traditional values shine through in small ways, such as bartering eggs for a beautiful homemade basket to put them in, and in bigger ways, such as making sure to value every living thing on the farm. And the idea of sustenance is a big part of their farm and also of tribal traditions and values. With that in mind, the Mitchells give butchered chickens to tribal elders and others. “It’s great being able to take care of the community that way,” Scott Mitchell said. Barry Dana, a former Penobscot Nation chief who is now an ultramarathoner and farmer in Solon, said it took a heart attack to get him to start thinking about food differently. That health scare nine years ago eventually led him to wonder how his ancestors did things. What did they eat? Could he eat the same way? Barry and Lori Dana eat a lot of moose, deer, fiddleheads, fish and the kind of traditional corn, squash and beans that his ancestors likely would have consumed with relish. There’s the Norridgewock bean, the Algonquian pumpkin and flint corn, which have been grown here for a long, long time, and there are the other vegetables they grow in the garden. The diet has been great for his health, and recently Barry Dana ran the 100-Mile Wilderness along the Appalachian Trail in less than 48 hours. “I give the credit to our diet,” he said. Clearly, Dana believes returning to native food ways is healthier than the standard American diet, with its focus on sugar and wheat flour. But for him the switch is about more than health. For Scott Mitchell, the path to becoming a farmer has been roundabout, but in some ways he has come full circle to his childhood. “I grew up in the ’70s in Bucksport and went to school at the H.O.M.E. Co-op [in Orland]. That hippie homestead lifestyle has always been in my blood,” he said. But he moved away from it pretty fast when, at 17, he joined the Marines. Mitchell served all over the world and was present for the First Gulf War in the early 1990s. He saw a lot, and yet never forgot where he came from. “There really isn’t any place better than where you grew up,” he said. So when he got done with the military, he came home to Indian Island, where among other jobs he worked for a long time as a bouncer in many local bars and nightspots. One night a few years ago when he was working a shift at the Bear Brew Pub in Orono, another bouncer asked him if he wanted a gift of some hens. Scott and Stephanie did, and soon became the proud owners of nine Red Star chickens. “That started us off,” Scott said. Slowly, the homestead developed. The Mitchells sell eggs, homemade soap, laying chicks and chicken meat from their small in-town lot. They’ve been working on reconditioning the soil so they’ll be able to grow vegetables there, too, and have plans to incorporate meat rabbits, pet rabbits, honey bees and value added products such as homemade chicken sausage into the farm mix. This summer, Scott Mitchell was accepted as a member of the national Farmer Veteran Coalition and the farm was certified to use the Homegrown by Heroes label. “It’s definitely been a progression,” Scott said. Homesteading has had some surprising side effects. Neither Mitchell can bear to eat industrial chicken now, which to them has the faint taste of chemicals from the bleach used in the processing process. “We’re chicken snobs now,” Scott said. Their 5-year-old daughter, Bailee, who is growing up on their farm, is their only child to so far have no interest in things such as playing video games. She prefers being with the animals. And Scott himself has undergone a transformation. When he started out with those first chickens, he also was working a desk job in accounts receivable for a local company. It wasn’t a good fit, and he was eating too much junk food and not taking very good care of himself. His weight had shot up to 347 pounds. The homestead is good for his mental health, too. Previously, when Stephanie was at work at a local convenience store, Scott spent a lot of time alone, having a lot of hard memories about his time in the Marines. For more information, please visit the Damnifiknow Farms Facebook page, visit it at 10 Down St. on Indian Island or call 817-0278. 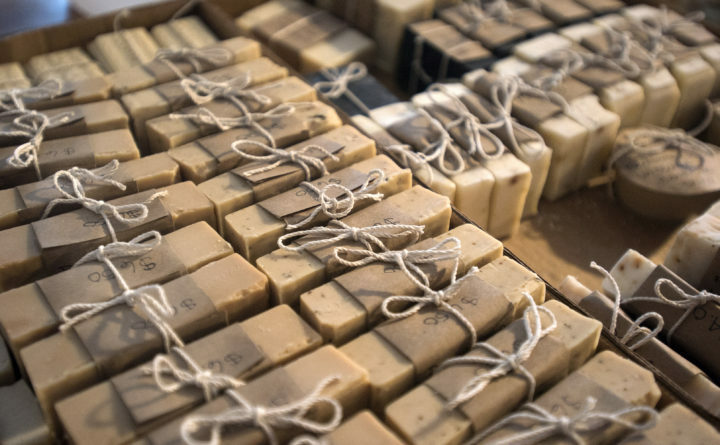 Stephanie Mitchell’s homemade soaps also can be found at Che’ Molly’s Trading Post at the Penobscot Nation Museum at 12 Down St.